As a witness to two world wars, Florence Bartlett believed that encouraging people to interact with folk art and with one another would help promote cultural understanding. Bartlett founded the world’s first International Folk Art Museum in Santa Fe, New Mexico as a result. 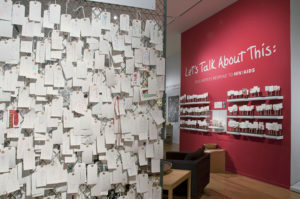 Her namesake – the West Bartlett Gallery – became the Gallery of Conscience in 2010 and is devoted to the examination of issues that threaten the survival of the traditional arts.